Hello AEA365 readers! I’m Sheila B Robinson, Lead Curator and sometimes Saturday contributor with a few tips on interacting with our blog. The aea365 blog allows for comments on any blog article. Commenting on a blog article is a great way to interact with the author(s) and potentially with others who comment. 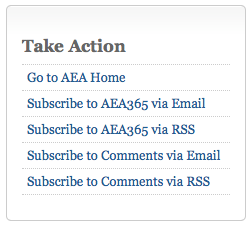 And if you’re an aea365 author, please consider responding to comments on your article. Commenters appreciate author responses! 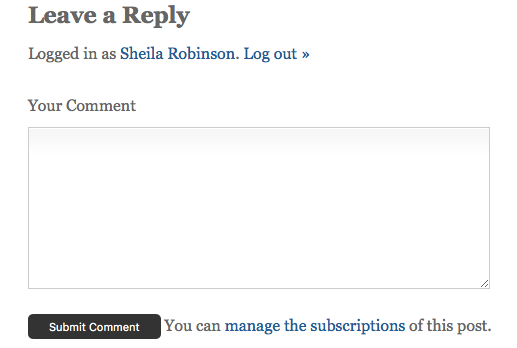 Cool Trick: In order to comment on a blog article, simply click on the word “comment” below the title of the article. Often, this will say “no comments” if indeed no comments have yet been offered, or will show the number of comments currently associated with that article. Once you click “comments” you’ll be able to scroll down and see where you can leave your comment. Hot Tip: Don’t worry if you don’t see your comment show up immediately! Our blog is moderated, so if you have not commented before, you will need to wait until one of the curators approves your comment. We try to check for comments at least every couple of days. Our settings are intentional for a few reasons. For example, we hold a comment in the queue if it contains 4 or more links because a common characteristic of comment spam is a large number of hyperlinks. Also, we maintain a short list of “blacklisted” words that, if they appear in a comment, will keep that comment from being published (at least until it is moderated). Don’t worry! I can’t imagine any of our authors needing to use any of these words in a blog post about evaluation! Cool Trick: You must subscribe to comments separately from the blog itself. On a computer, look at the upper right of your screen to see your options for subscribing. Rad Resource: Me! I’m always here to answer any questions, and happy to help with any matters having to do with our blog.